Before Bryan Singer’s X-Men (2000) film demonstrated the artistic and commercial potential of some of their titles, it seemed like Marvel Comics didn’t care how they were adapted to the big screen. And so, we had horrible misfires like Howard the Duck (1986), The Punisher (1989) and the little-seen Roger Corman-produced The Fantastic Four (1994). 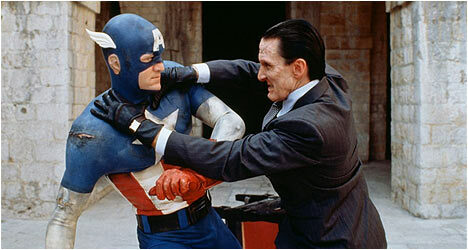 Thrown in with this crop of misguided efforts was Albert Pyun’s take on Captain America, a project that was to be released in 1990 to celebrate the character’s 50th anniversary but the end result failed to impressive movie studio executives so much that it was buried for two years before being quietly released on home video where it faded into obscurity. Capitalizing on the far superior Joe Johnston-directed effort that came out in the summer of 2011, MGM has finally given Pyun’s film a legitimate DVD release. Forced to watch as his family is executed by Italian fascists (led by a hilarious looking Mussolini wannabe), a young boy is subjected to a top secret project that transforms him into a super strong, super smart soldier for Hitler to exploit. This boy grows up to become the Red Skull (Paulin), a grotesque-looking tyrant. However, a female Italian scientist manages to escape and shares her knowledge with the United States government. They decide to create their own Super Soldier program, headed by Lieutenant Colonel Louis (Nouri). Steve Rogers (Salinger), stricken with polio (we know this because he walks with a pronounced limp), volunteers to become the project’s first guinea pig. The experiment is a success but the female scientist is killed by a Nazi spy and, in turn, dispatched by a newly transformed Rogers. Dubbed Captain America by his superiors, he’s quickly brought into active duty as Lt. Col. Louis drops him in behind enemy lines where he wages a one man assault on the Red Skull’s top secret Nazi base. In battle, the Red Skull bests Cap and straps our hero to a rocket bound for the White House but ol’ Winghead manages to redirect it to Alaska (?!) where he’s buried in ice and snow for several decades. In the intervening years, the Red Skull has undergone extensive plastic surgery to make himself like somewhat human (although, his face looks like a jumbled up jigsaw puzzle) and has built up a powerful international cartel comprised of rich and influential businessmen, politicians and high ranking military brass. He’s also kept busy over the years orchestrating the assassinations of John F. Kennedy, Robert Kennedy and Martin Luther King. Meanwhile, some researchers stumble across Cap’s frozen body. He breaks out of his icy prison and resumes his pursuit of the Red Skull. The first thing that strikes one about Captain America is its modest budget, which limits the film’s scope and gives the various sets a cheap, made-for-T.V. look. It also explains the casting of little known actor Matt Salinger as Cap and then surrounding him with veteran character actors like Ned Beatty and Ronny Cox. The screenplay, by Stephen Tolkin, is pretty awful with the Red Skull spouting cheesy bad guy dialogue (it doesn’t help that actor Scott Paulin adopts an outrageous accent) while an environmental subplot is awkwardly shoehorned into the story. It quickly becomes obvious why this film was relegated to obscurity back in the day and promptly forgotten. It must also be said that the transfer of this film is shockingly poor. It looks like a VHS copy of the film was simply burned onto a DVD.